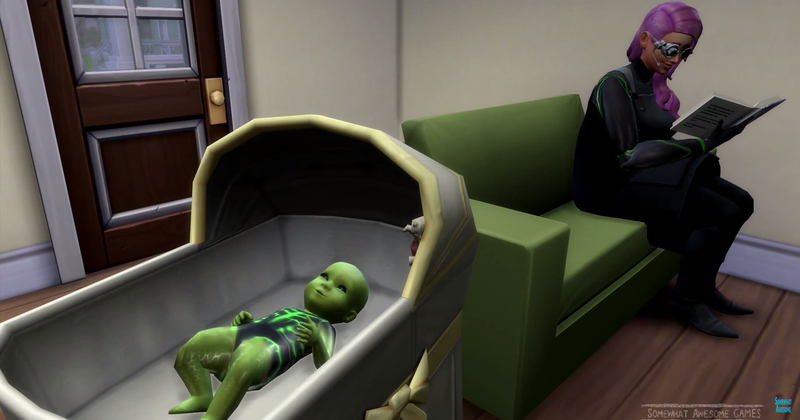 The Sims 4's first expansion pack comes out this week. In addition to all the cool new career-focused additions Get To Work brings to the game, it also adds aliens into the mix. Here's what you need to do to find them. Reach Level 9 in the Science career path. Invent the “Electroflux Wormhole Generator” device. Since people only have access to pre-release builds right now (the expansion comes out tomorrow), the full list of required parts isn't spelled out yet. I'll update this once I have that information. Install the wormhole generator on a spaceship—either one that you own and have installed at your scientist Sim’s personal home, or the one located at the snazzy new research facility the expansion pack adds to the game. Select “Travel Through Wormhole” from the available options when clicking on the upgrades spaceship. ...which leads to aliens babies, of course! Still no toddlers, sadly. I guess even the alien technology wasn’t sophisticated enough to pull that off. Yet. I still have my fingers crossed. Alien Sims don’t have access to all of the standard CAS features like, say, facial hair. But they’re also aliens! Do you really expect them to grow beards? If you do, well...I’m sure there will be some custom content that allows you to pump out bearded aliens Sims to your heart’s content by week’s end.